Posted on July 01, 2013 at 9:50:04 am by Michelle M.
This post is part of a series highlighting the Your Story. Made Here. videos recently produced by the Northeast Indiana Regional Partnership. These videos share the stories of Northeast Indiana, and our many strengths. Click here to view the rest of the series. What makes a city a vibrant place that people want to live in or visit? One of the major factors is a city’s ability to provide access to a healthy lifestyle through trails, bike lanes, and outdoor fitness events. In the last few years Fort Wayne in partnership with the Northeast Indiana region has really stepped up it’s efforts to provide healthy lifestyle options for those looking to be outside and on the move. Recently named to the Bronze Level of bike friendly cities by the League American Bicyclists. Fort Wayne continues to build a culture that encourages healthy lifestyles for all of its citizens and visitors. Fort Wayne Trails provide 68 miles (and growing) of trails throughout Northeast Indiana with 50 of those miles connected. Fort Wayne resident, Mike Kelly, is a big fan of the trails. “My favorite stretch is from North Anthony to Moser Park in New Haven and I can&apos;t wait for the trail to be extended from there down to the Public Safety Academy. There is nothing like a long weekend bike ride or a short, after work trek on the trails. The people I come across on the trails are always friendly and smiling. To feel the fresh air on my face and have the time to process and think through the challenges and joys of life - my time on the trails is priceless.” In addition to trails, bike lanes continue to be added to many area streets providing people the ability to bicycle to their destination instead of driving. As a downtown resident, the bike lanes have encouraged me to give up my car and bike to my destination when it’s a little too far to walk and I still don’t want to drive. The trails throughout Fort Wayne provide cyclists, runners, and walkers the ability to get to various destinations while rarely being on a city street. I’ve also used the trails to train for the Komen 3Day, a 60-mile (20 miles/day) walk for breast cancer. The trails provided a safe, smooth, and easily accessible place to train for the event. Fort Wayne Trails offers a downloadable map of the trails at www.fwtrails.org/maps Fort Wayne locals and visitors have also been on the move training for Fort 4 Fitness, the city’s half marathon. The event partners with Fort Wayne’s Smallest Winner to celebrate the success of each participant. Fort 4 Fitness provides a variety of events for people at all activity levels and of all ages. In addition to the half marathon, there is a 10K, a 4 mile run/walk, a kids marathon, and a seniors marathon. People travel from all over the country to participate in this great event that sets record-breaking attendance levels each year. 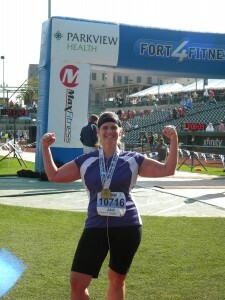 Fort Wayne’s Julie Tutwiler credits training for Fort 4 Fitness as her motivation to get healthy. "Prior to being selected nearly two years ago for a running challenge group, I was sedentary and weighed over 200 pounds. Once I began the challenge group, I found that running (and subsequently other workouts) was a way for me to get away from the day-to-day challenges of work, running a household, raising two children (including one with a disability) and more.” Tutwiler has seen results she never thought possible, like sustained weight loss and a passion for running, “Since I began this journey I have lost weight (about 50 pounds and multiple pant sizes) but gained so much more such as lifelong friends, a passion for healthier eating and fitness and confidence in my abilities. I have now completed multiple 5K and 10K races, two Half Marathons and one Warrior Dash Obstacle/Mud Run and look forward to many more races over the next year and beyond. Now I crave new challenges and look for ways to try something new!" Whether you’re new to an outdoor healthy lifestyle, looking for a place to clear your head, or you’re a seasoned athlete it’s easy to be outside and on the move in Fort Wayne. Tags: Outdoor Recreation, trails, Fort for Fitness, Fort 4 Fitness, marathon, running, Your Story. Made Here.